Outside cold, a blustery, muddy goop. Inside warm, a calming, hearty soup. Why mess with perfection? 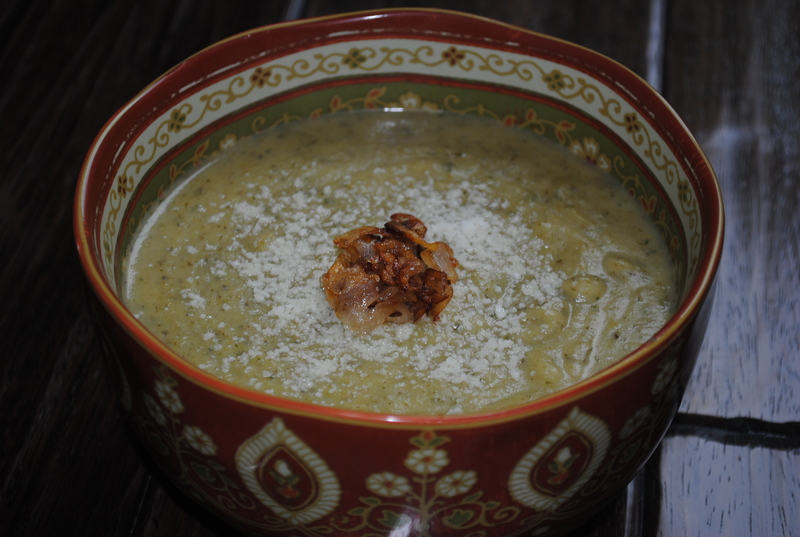 There is nothing to add to this delicious soup that would make it any better. 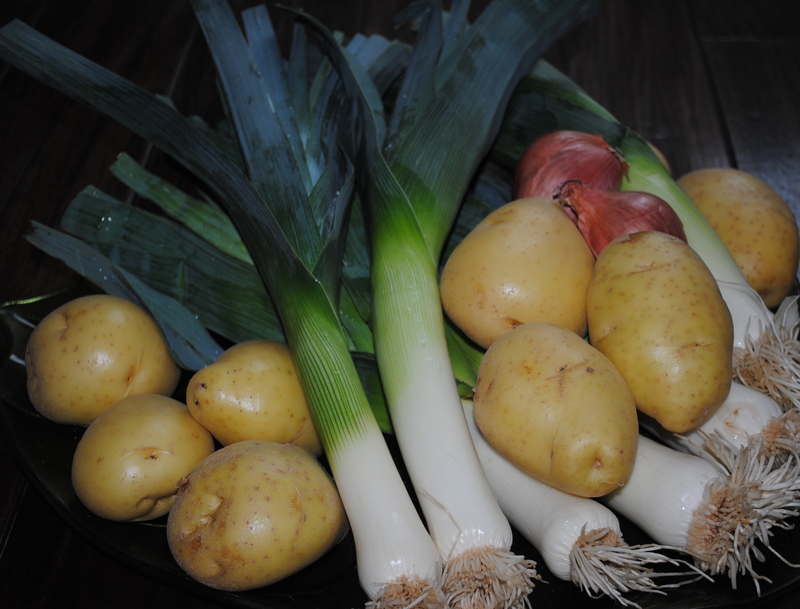 Just one thing, make sure to clean the leeks thoroughly, otherwise you’ll be eating dirt soup. Make that two things, 6-7 cups of stock is a lot of liquid. I didn’t use that much, especially since the recipe also calls for heavy cream and creme fraiche. Wait, one more thing. A little bit of this soup goes a long way! Combine the potatoes and leeks on a sheet pan in a single layer. Add the olive oil, 1 tsp. salt and 1 tsp. pepper and toss to coat the vegetables evenly. Roast for 40-45 minutes turning them with a spatula a few times until they are very tender. Add the arugula and toss to combine. Roast 5 more minutes. (Ina’s Recipe is a little different here but this worked perfectly well) Place the vegetables in a pot and make sure to scrape up the crispy roasted bits, stir in the wine and 1 cup of chicken stock. Cook over low heat for a few minutes. Unless you have an Immersion Blender, which is so much easier, transfer the roasted vegetables to a food processor fitted with a steel blade, adding the liquid and about 5 cups of the chicken stock to make a puree. Pour the puree back into the pot or large dutch oven. Continue to puree the vegetables in batches until they’re all done. Add enough of the remaining 1-2 cups of stock to make a thick soup. Add the heavy cream, creme fraiche, 2 tsp. salt and 1 tsp. pepper and taste for seasoning. When ready to serve, reheat the soup and gently whisk in 2 T of white wine and 1/4 cup Parmesan. Serve hot with extra Parmesan and crispy shallots. Heat the oil and butter in a pan over medium-low heat. Reduce the heat to low, add the shallots and cook 30-40 minutes until rich golden brown. Stir them ocasionally to make sure they brown evenly. Remove from the oil with a slotted spoon, drain well and spread out to cool on a paper towel. Once they have dried and crisped, they can be stored at room temperature, covered, for several days. This is one soup I make almost once a week…ofcourse without the leeks.There is something oddly comforting about warm brothy potato soup on a cold day.Looks amazing in that pretty bowl. Sounds great. Love that there’s arugula in there. Looks pretty darn perfect to me! I agree. why mess with perfection indeed! and these two flavors heightened by roasting are just superb. Looks like something I could eat five bowls of!